Your Next Ensemble is an international fashion company focusing on the promotion of fashion through content websites, search marketing, and social media. Our portfolio includes 9 fashion websites, some of which are listed below. With a combined following of several hundred thousand fans on Facebook and Twitter, our goal is to become the world’s one-stop destination for fashion lovers and promoters. Your Next Shoes is a fashion website dedicated to the shoe fetish. We’re always on the lookout for the latest designs, hottest styles and newest trends in footwear, be it on the runway or on the streets. We’re constantly on the hunt for the best shoe coupon deals and sale information. Our goal is to make this site your go-to channel for the latest styles, the latest celebrity favorites, and the latest must haves – whether it be expensive designer “it” bags or mass market affordable pieces that serve the same purpose. Your Next Dress is a website dedicated to the frock fanatic. We cover all kinds of dresses – from super affordable street labels to ultra expensive high-fashion pieces seen only on the runway or on the red carpet. 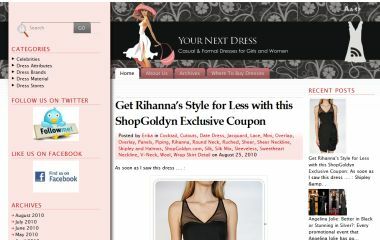 We’re your go-to site for everything dress related – that includes the latest trends, the newest arrivals, the freshest designers to hit the scene, and of course, the most amazing (coupon) deals! Our goal is to become the leading community for jewelry enthusiasts online. We may have the word “jacket” in our name but we really feature more than that. We also touch on kids’, men’s and women’s coats, vests, blazers, sweaters, cardigans, capes, pullovers and hoodies, and pretty much everything else in between. In short, we cover all our favorite clothing coverings that well, literally keep us covered! This site is devoted to everything about scarves and wraps – from celebrity spots, to product reviews, to practical tips that will help you fall in love with scarves and wraps a little more.